The Robotics@Maryland team members who competed in San Diego. Robotics@Maryland won the Association for Unmanned Vehicle Systems International and Office of Naval Research 11th Annual International Autonomous Underwater Vehicle (AUV) Competition in San Diego, Calif., this past weekend. The Maryland student team competed against 25 other teams from across the United States, India, Canada and Japan. The other schools in the top eight included University of Texas at Dallas, École de technologie supérieure, University of Florida, U.S. Naval Academy, University of Victoria, Cornell University and Florida Atlantic University. Each team was challenged to design and build an AUV capable of navigating realistic underwater missions. The Maryland team won the competition in only its second year of participation, taking home $7,000 in prize money. 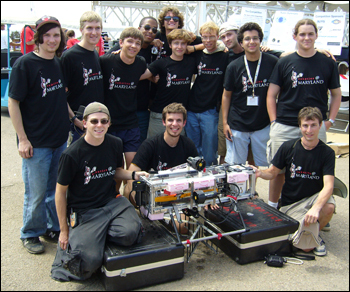 The University of Maryland's team of thirteen overcame many challenges during the competition. "Despite losing our main vehicle computer, busting a thruster propeller, temporarily losing our firewire cameras, and watching three team member's laptops die (including mine), the group worked together and handled each problem in turn," said Joseph Gland, graduate student advisor for the Robotics@Maryland team. The team reached the finals in first place. The final competition entailed dead reckoning approximately 50 feet through the starting gate, pipeline following, buoy docking, tracking and hovering over an acoustic pinger, grabbing an object and surfacing with the object to a floating ring, Gland said. The Robotics@Maryland team is made up of students across the campus, including several different engineering majors. The team was assisted by Prof. Dave Akin in the aerospace engineering Space Systems Lab and Prof. Nuno Martins, who serves as faculty advisor. The team is sponsored by the Department of Electrical and Computer Engineering, the Department of Aerospace Engineering, the Institute for Systems Research, the Clark School of Engineering, and the UM Office of the Vice President for Research, and also receives corporate support from Clark School Corporate Partner BAE Systems, E.K. Fox and Apple. Memsense was also a sponsor, donating an Inertial Measurement Unit and other electronic hardware. The Robotics@Maryland team benefited from a particularly useful and unique facility at the Clark School's Neutral Buoyancy Research Facility in the Space Systems Laboratory on the University of Maryland campus—the only such university-based facility in the country. The 50-foot diameter, 25-foot deep water tank is used to simulate the microgravity environment of space. Prof. Akin allowed the student group to test their autonomous underwater robot, Tortuga II, at the facility, which proved a valuable environment for practicing the robot's maneuvering capabilities. Fox 5 TV filmed live shots from campus, showcasing championship robotics at Maryland. Interviewed are Robotics@Maryland students responsible for past success and those hosting this weekend's Autonomous Robotic Speedway Competition. On the other side of the Atlantic, the student robotics group at the University of Maryland won an international underwater robotic competition earlier in August, and is preparing for another contest, this time for land robots.